Admission to courses is open to all candidates who meet the requirements stated below. The number of places made available is limited. To apply, please use the online Application Form which contains complete information on the required documents, including reference letters and motivation letter, to be provided. NOTE : IIEP is using a new online training management system. Click on this link for some instructions on the online application process. 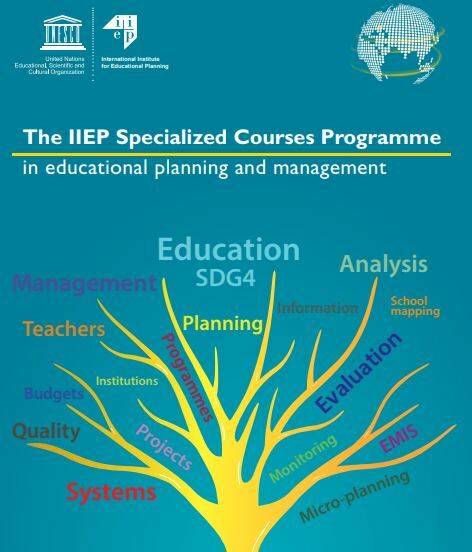 If you have any difficulties with or questions about using the new system, please contact tep@iiep.unesco.org. If you have a current online application in progress with our former system, we will be in touch with you. Academic qualification: a university degree or equivalent (minimum three years of undergraduate studies) preferably in a field related to educational planning and management. Professional experience: a minimum of three years’ professional experience as a practitioner, trainer or researcher in the planning or management of formal or non-formal education. Language proficiency: a good working knowledge of English or French. Computer literacy: very good knowledge of Word and sometimes Excel (depending on the course). Funding: the candidate’s application must specify how the course fees and other participation costs will be met. A scanned copy of the Name and date page of your Passport. Scanned copies of diplomas, degrees and other relevant training certificates. A Language proficiency certificate, if your first language is neither English nor French. SCP Application forms must be completed and submitted online with the required documents uploaded onto your application. Do not send supporting documents by email. Applications are processed on a first-come-first-serve basis. The decision on acceptance is communicated to the applicant within three weeks following the receipt of the application. Incomplete applications are not reviewed, so please follow instructions carefully. Participation costs must be provided for by the participants. The financial information will be provided to successful candidates together with the official admission letter. Admitted candidates are allowed to attend the programme only if the required amount has been transferred to IIEP before their arrival. IIEP is not a funding institution and cannot offer financial assistance, with the exception of one scholarship per year for female planners. Candidates are encouraged to apply to funding institutions for fellowships or grants (their employer, including ministries, international organizations, and NGOs). These grants are generally funded from institutional capacity development programmes sponsored by governments, international cooperation programmes, or directly through international partners, such as development banks, bilateral agencies, or UN funds and programmes. UNESCO member states may submit a request for funding from the UNESCO participation programme through the UNESCO National Commission. The procedure and schedule for the submission of funding requests are available at the UNESCO website. subscription to a health/accident insurance policy. All participants have access to high-quality equipment, whether for face-to-face or distance learning. IIEP provides participants with the most modern pedagogical tools: classrooms fully equipped with innovative computer equipment, a Documentation Centre for resources which also provides a quiet study space, a cafeteria for lunch breaks and impromptu conversations, as well as other living spaces such as a flower garden and terrace – all of which create an atmosphere which energizes participants, motivating them to work hard and get the most out of their training. For training organized on IIEP’s premises, the Institute offers participants a unique research environment. Participants have individual access to frontline software and the Institute’s extensive database. IIEP benefits from a rich Documentation Centre with more than 30,000 publications and over 500 specialized periodicals and journals devoted to educational policy, planning, management and related areas (economy, demographics, statistics, sociology, public administration, political science, etc.). Participants are also ensured free access to many other libraries and documentation centres in Paris. IIEP also provides access to important online resources such as Planipolis, and offers exchanges with online communities. IIEP has no accommodation facilities of its own but assists participants in finding accommodation. Upon requests received from admitted candidates, IIEP can help to arrange accommodation.